WHY CANICROSS COULD BE GREAT FOR YOU AND YOUR DOG! We all know how much our canine companions love adventures in the great outdoors! If you have a dog and you’re searching for a way to build more exercise into your routine then canicross could be a great place to start! Here at The Insurance Emporium, we’re always looking for ways to make the most of what we love. That’s why we’ve put together this handy guide to help introduce you and your pup to canicross! 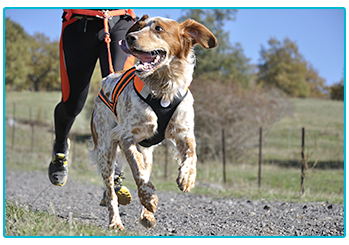 Canicross is essentially cross-country running with your dog! Instead of running alongside them, you’re attached to each other so your dog is able to pull you along, making it easier for you to keep up. First and foremost, it’s a really easy way to improve your own fitness and that of your pet. Also, it can fit seamlessly around your life – you already take your dog for walks, so why not take it up a notch by turning them into runs? As well as improving your dog’s fitness, canicross can really help stimulate your pup mentally! They’ll be responding to instructions and following their natural instinct to explore. This could help dogs with high energy remain calm and give them a way to tire themselves out (other than destroying your home)! It might be good to stick to off-road terrain, as harder surfaces can harm the pads on your dog’s paws. Following a trail is better than being in the open; it gives dogs a path to follow and they’re less likely to be distracted by something far off – pulling you along for the ride! 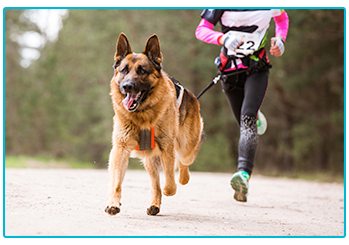 There are just three bits of equipment you’ll need to start your canicross adventures. The first is a comfortably-fitting harness for your dog. Also, a bungee line, stretching to around two metres. This will absorb any sudden jarring for both you and your pup. A walking belt might also be a good idea. Worn across your waist, you can clip the line to it and run completely hands free! 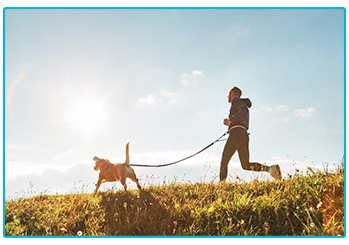 You should always consult your vet before deciding to take your dog running, but generally speaking, most dogs will be able to do canicross, providing they’re fit and healthy! It’s important to wait until puppies are around 12-18 months old though, as their bones need to have grown to their full strength, or they might suffer long-term damage. You might need to introduce your dog to canicross gradually. Begin with familiar routes, praising them when they follow your instructions. Start with short runs, stopping whilst they’re still enjoying themselves and before they’re completely tired out. This could make them eager to get going out more as they realise how much fun they’re having! Finding others to share your new hobby could be a great way to stick to it and improve! A group might also be able to offer some great advice when you’re starting out. Nowadays, there are canicross groups who meet regularly all over the UK, so it shouldn’t be too hard to find likeminded humans and canines! If canicross sounds like your kind of thing, it could be really easy to get you and your furry friend out and running! For high octane activities or gentle walks in the park it could be worth insuring your pet. The Insurance Emporium offers up to 30% discount* on Dog Insurance policies. Get running to The Insurance Emporium today to find out more! * The 30% discount is available on lunar and calendar monthly policies and policies where the premium is paid annually. It is made up of 20% Introductory Discount plus 10% Multi-pet Discount (if appropriate). The Introductory Discount is available for the first 12 premium payments on lunar and calendar monthly policies or one premium payment on annual policies.